In 2004, Jerry Almeida, then the fundraising director of ActionAid India, was shocked to discover an office in the garage of their Bangalore headquarters where some of the staff were penning letters in a child's scrawl. The letters were sent out to individual donors all over the world, allegedly written by the Indian children people were paying to sponsor. The forgeries were far from the personalized interaction that the charity led the sponsors to believe. Sandeep Chachra, the CEO of Action Aid India, denied to TIME that the staff members wrote the letters themselves. "The children write the letters with the help of community workers and sometimes as part of school exercises," said Chachra. "Our staff has no role to play in it." The alleged transgression is not a lonely instance of unscrupulousness in India's sprawling nonprofit sector. With 3.3 million registered NGOs, India's nonprofit sector raises between $8 billion and $16 billion in funding every year. According to Home Ministry statistics, foreign funding to Indian NGOs saw a 56% increase in the 2005-06 and 2006-07 fiscal years. 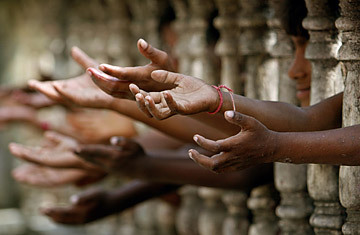 In 2008, the latest available data, the total official foreign aid to India was $2.15 billion. But according to NGO watchdogs, almost half of that money is misused, mostly to support high administrative costs of running organizations. "NGOs who raise Indian donations are accountable to the Indian public, but foreign donors are abroad and there is no accountability. They receive a letter and they are happy that they are helping some Indian child," says Mathew Cherian, chairperson of the NGO watchdog Credibility Alliance. "There are many NGOs who won't even show you their accounts." NGO accountability  or the lack of it  is, of course, not India's problem alone. A 2008 assessment of 30 of the world's most powerful global organizations cites transparency as one of the least developed dimensions of accountability. In India, the problem is compounded by the highly unorganized nature of the NGO sector: organizations are often required to register under multiple laws without any uniform accounting policy or reporting framework. It's a problem driven both at the organizational and the donor levels. Says Almeida: "Money is important for development but most people get swayed by emotional provocation and pay money to NGOs indiscriminately." One of the key complaints against Indian nonprofits is their overspending on overheads. A 2006-07 government report on utilization of foreign funds by Indian NGOs shows that out of the $2.15 billion in foreign aid received, around $680 million was used for organizational expenses, compared with $563 million used for relief and rehabilitation of victims of natural calamities, $435 million for rural development, $269 million for construction and maintenance of schools and colleges, and $263 million for welfare of children. "Every organization has legitimate administrative costs," says Thomas Chandy, CEO of Save the Children, India, which spends around 14% of its funds on administration. "It is impossible to distinguish administrative costs from program costs because it's all set up for delivering programs." Instead of focusing on how money gets allocated, Chandy says, "we should look at the impact created at ground level." But there are other uncomfortable questions that also call the credibility of a lot of Indian NGOs into question. Chief among them is businesses using NGOs for money laundering. India's federal investigation agency is currently looking into money-laundering and fund-misappropriation charges against one of the country's most prominent human-rights activists, Ravi Nair. Nair and his NGO, the South Asia Human Rights Documentation Centre, were indicted by the European antifraud agency in October of last year, though Nair has denied all wrongdoing. While groups like Credibility Alliance, iCongo and GiveIndia are working toward increasing NGO accountability through annual reviews and accreditation, they still have a long way to go. Despite being around for many years, these watchdogs are used only by a few hundred NGOs. Credibility Alliance, for example, has only 600 members. Even international organizations like the Humanitarian Accountability Project, an international agency that seeks a voluntary system of accountability for 40,000 international NGOs, has only 36 members globally. The Société Générale de Surveillance, the world's leading for-profit inspection, verification, testing and certification company, has certified only 68 of the world's approximately 10 million NGOs. USAID-funded ForeignAID Ratings has certified three. Foreign aid to India has come under the microscope by foreign donors over the past few years, with critics arguing that India  with a defense budget of $31.5 billion, a substantial foreign-aid program of its own and a U.S.-endorsed claim to a permanent Security Council seat  should be able to fund its own development. Today India is still home to 42% of the global population living on less than $1.25 a day, but if the World Bank's forecast that poverty in India will fall by more than a third by 2015 is correct, the government needs to take a closer look at better use of its foreign aid. In response to these complaints, the federal government has been tightening its grip. New Delhi has banned 41 NGOs from receiving foreign funding in the past few years, and in August, the government revised the Foreign Contribution Regulation Act, a 1976 law that oversees NGOs that receive foreign funding. Under the act, organizations have to submit an annual report to the government giving details of the funds received and their utilization. In 2008, out of the 34,803 registered associations, only 18,796 filed their reports. Now, with this year's revisions, NGOs that do not file returns to the Home Ministry will lose the right to receive foreign funds for three years, which will, in many cases, effectively suspend their operations. India's latest five-year plan also advocates a single comprehensive law with a single set of accountability procedures to encourage accountability and transparency within the NGO sector. After all, as Chandy says, NGOs are in the "credibility market" and they cannot afford to be above accountability. Correction: Due to an editing error, a response from Action Aid was not included in the original version of this story. Sandeep Chachra, the CEO of Action Aid India, said, "The children write the letters with the help of community workers and sometimes as part of school exercises." He denied that staff members wrote the letters themselves: "Our staff has no role to play in it." See pictures of India's changing visual landscape.